At Prismalence we base our solutions on how we as humans experience light, to optimise lighting for all environments we enter. These pages explain more about light and how it functions. The most common method of metering light is to measure the output at a point in the light’s colour spectrum that is primarily yellow. This method is based on the ambition of finding the optimum illumination for an eye that is trying to see in daylight. Today we know better. To create good lighting it must be adapted to how the eye functions in evening light. It is about getting the eye to see a colour spectrum that is similar to the sun’s, even when it is dark. At Prismalence we use the sun as our template and use products that give a white light with a broad spectral output. This means that, with the same outputs applicable under current legislation, we can create a better quality of light. Energy and the environment are strongly connected. How we use energy has a significant impact on our common environment. It means that we also have a common responsibility to think about how we use energy. How much we burden the environment with our lighting depends on several factors, including how efficient the lighting installation is, how much material is used in manufacture, what the service life of the installation is and how effectively it can be maintained. At Prismalence we take this responsibility by offering products that save both money and energy. Our closed systems give minimal stray light and give high energy savings, even when compared to systems using the same light source. With the same outputs we offer a higher quality of light which means that it requires less energy to create a good working environment. 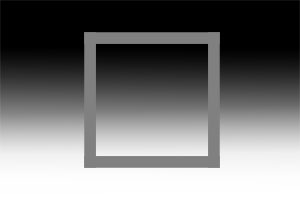 The image below shows how the uniformly grey frame appears lighter or darker depending on the background. Overlighting one area makes the areas around it seem darker. Always strive to light correctly and think – Energy. That is what we must save. Good lighting is an important investment. It is not just about the environment and the working environment but also, clearly, about money. We want to help you find the lighting that meets your needs. In order to obtain as accurate a cost image as possible, we help you to carry out an LCC Calculation. The calculation works out the cost of the installation over its lifetime. It takes total energy consumption, service intervals, purchase, installation and other costs into consideration. At Prismalence we count on our installations paying for themselves in three years, depending on design. Thereafter, you will be able to count on a saving of at least 50 percent compared to previous lighting. Light and lighting are all about how the eye and brain interpret an illuminated surface. The light that is reflected from the surface is what we interpret as light. The image above gives a clear example of the importance of good light with a high colour rendering index. The area on the right bank of the river is illuminated with high pressure sodium and the left bank has a 35W Cobra armature with ceramic metal halogen. High pressure sodium has a colour temperature of 2200K and a CRI of around 20. Ceramic metal halogen which we use in our armatures has a colour temperature of 4200K and a CRI of over 90. The example image is from Hofors. On the following pages we explain the importance of good lighting and the difference between white light with high colour rendering and yellow light with lower colour rendering. What we call light in everyday speech is energy that travels as electromagnetic radiation and where our eyes can detect wavelengths between approx 400 nanometers to 700 nanometers. The eye detects different wavelengths differently which is displayed in the lines of the weighted graph. 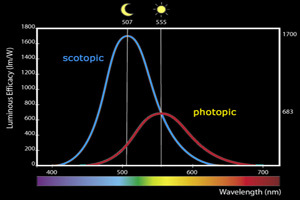 There are two lines on the graph to show how the marked differences in the eye’s sensitivity between night conditions (scotopic – blue line) and daylight conditions (photopic – red line). In daylight we see more shades of colour (millions) but are less light sensitive (the line is lower) and we are most sensitive for wavelength 555 nm which is typical for sun light. At night we are almost three times as light sensitive but we can only see perhaps a hundred thousand shades of colours. We are then most sensitive for 507nm – typical of moonlight. 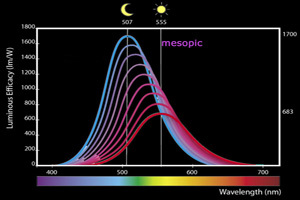 The eye has more than two modes of sensitivity, the eye actually adapts itself to the prevailing light conditions on a continuous basis and moves steplessly between full photopic adaptation in strong daylight to full scotopic adaptation in weak moonlight. This range is called Mesopic vision. Mesopic vision is an interaction between cones, rods and iris that is affected by factors such as age and diet, as well as other things. It is therefore not possible to establish an exact value for Mesopic vision or to state a light source’s efficiency in relation to Mesopic vision. The efficiency of a light source is given in relation to Photopic vision, which has a fixed value. However, this means that the light source’s efficiency is measured by how well the eye receives light from it in the middle of the day in strong sunlight. Lux meters are also set to measure energy in accordance with the line of the weighted graph that the eye follows on a sunny day.